A trailer hitch cover protects the opening in an empty hitch receiver tube. Without being covered, an open receiver tube invites water, dirt, sand, grime, bugs, and more inside the tube, all of which will need to be cleaned out before inserting a ball and hooking on to a trailer. Grit and grim inside an empty receiver on a hitch can also possibly cause accelerated wear, tear, rust, or other damage, and make it harder to insert a ball. For those reasons, a lot of people like to use trailer hitch covers to cover their hitch receiver tubes when not in use. Hitch covers are not only practical, they have become a common place to add bling or style to a vehicle. 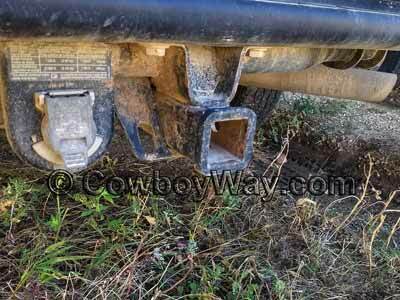 Below are cowboy trailer hitch covers (covers with cowboy or Western designs) for sale. 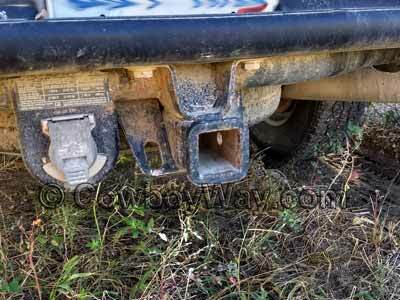 Below: An empty receiver hitch is exposed to water, dirt, bugs, and more. Just one of the cowboy trailer hitch cover designs available from Zazzle. Below: The same empty trailer hitch receiver tube as shown above. Without a cover, it is collecting dirt, debris, and spider webs inside.